Here is my review of Elsie's Bird. Then a dark cloud covers the sun in Elsie’s life. Her mother dies and Elsie’s Papa decides that he needs to leave Boston to go somewhere far away so that he can leave behind “the sadness in his heart.” When they get to their farm, which lies in the middle of a sea of grass in Nebraska, Elsie realizes that her new home is going to be nothing like her old one. She misses the sight and sound of the sea. She misses being around other people. Elsie dreams “of Boston cobbles and bells.” The one thing that lifts her spirits is the presence of Timmy Tune, a little canary. Throughout the day Elsie and her pet sing “back and forth.” Timmy Tune’s little voice injects some sunshine into Elsie’s otherwise sad and lonely life. Then one day Timmy Tune gets out of his cage and Elsie runs out into the grass to find her beloved pet. How will she survive in this place without him? In this magical picture book, Jane Yolen takes her readers back to a time in American history when many families left the places they knew and went west. They gave up much that was familiar to build a new life on the open prairies. Eagerly or reluctantly, children went to these new places, and for many of them it was a shock to discover that their new home was nothing like the one they had left. With sensitivity and lyrical writing that beautifully captures the essence of Elsie’s world, Jane Yolen has once again created a book that will delight readers of all ages. Elsie's Bird Blog Event Day One - Jane Yolen's 300th book! Award-winning, bestselling author Jane Yolen, whom Newsweek dubbed “the Hans Christian Andersen of America,” is publishing her 300th book this fall. Yolen’s books and stories have been honored with some of the publishing industry’s most distinguished awards, including a Caldecott Medal, a Caldecott Honor, two Nebula awards, the Jewish Book Award, and two Christopher Medals. She’s received three body-of-work awards and six honorary doctorates. Yet when she began her writing career as a journalist and poet, she could never have guessed that someday she'd be the author of 300 books for children, teens, and adults. 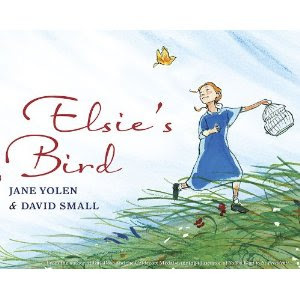 Yolen marks the milestone with Elsie’s Bird (Philomel), a lyrical picture book illustrated by Caldecott Medalist David Small, about a motherless Boston girl who moves to the Nebraska prairie. The author’s words also sing out in five other new books this fall: Lost Boy: The Story of the Man Who Created Peter Pan (Dutton), a picture book biography of J.M. Barrie; Hush, Little Horsie (Random House), which tucks in the youngest picture book lovers with a lullaby of love; Switching on the Moon: A Very First Book of Bedtime Poems (Candlewick), an anthology co-edited with Andrew Fusek Peters; The Barefoot Book of Dance Stories , written with Heidi E.Y. Stemple (Barefoot Books), featuring dance folktales from around the world and a story CD narrated by Juliet Stevenson; and How Do Dinosaurs Laugh Out Loud? (Cartwheel Books/Scholastic), a lift-the-flap book. For this Poetry Friday I have a review of a book that I read and reviewed just a few days ago. This collection will appeal to young readers who have a fondness for animals. 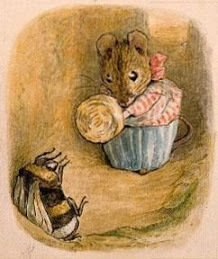 As you watch a bumblebee buzzing around a flower you might wonder if these busy little creatures “fumble,” “bumble,” “mumble,” or “tumble.” Are they as clumsy as their name suggests? They certainly work hard enough, and they seem very efficient as they fly from flower to flower. Could it be that their name really does not suit them after all? If you watch an armadillo, it looks as if it is slow. It seems to “wallow” under the weight of its heavy protective covering. Appearances can be deceiving though. Armadillos are actually quick on their feet, and woe betide any insect who happens to walk into an armadillo’s path. It will soon end up as armadillo food. For this excellent collection of poems, Dabney Stuart explores a colorful collection of animals. We read about koalas, whales, a dove, groundhogs, newts, and many more creatures of all kinds. With humor, delightful details, and interesting connections, the author paints pictures in words. Young readers are sure to enjoy the different poetry forms that they will encounter in this book, and they are sure to become fond of at least one animal that is mentioned in this poetical menagerie. For the first time in the publisher’s history, today Random House Children’s Books (www.randomhouse.com/kids) is releasing an e-book original, written by the acclaimed New York Times bestselling author Michael Scott and entitled THE DEATH OF JOAN OF ARC: A Lost Story from the Secrets of the Immortal Nicholas Flamel (Delacorte Press Books for Young Readers / $0.99). The story is available exclusively in digital format and is the newest addition to Scott’s series The Secrets of the Immortal Nicholas Flamel, which has sold more than 1 million copies to date in North America. Following on the heels of the publication of The Necromancer (May, 2010), the e-book original is a short story that will fascinate fans. “With the exception of the two teen characters, Michael Scott’s series is based entirely on individuals transplanted from history, mythology, folklore, and legend,” explains Beverly Horowitz, Delacorte publisher. “Michael’s new e-book original is certain to entertain fans and satisfy them as they wait until the publication of the next book in the six-part series, The Warlock (2011).” For more information about Michael Scott and the series visit Facebook.com/SecretsofNicholasFlamel. Fans can also play the online game at QuestfortheCodex.com. THE DEATH OF JOAN OF ARC: A Lost Story from the Secrets of the Immortal Nicholas Flamel is available wherever e-books are sold. In THE DEATH OF JOAN OF ARC, Scott delves into the idea that the legendary Joan of Arc was not, in fact, burned at the stake in Rouen, France, in 1431. Instead, she was rescued from death by Scathach the Warrior. The truth about that day is revealed in the last will and testament of William of York. Scott’s new short story will leave readers wondering if Joan of Arc still roams the Earth today. This e-book original offers a never-before-seen story of two warriors who would become sisters. Random House Children’s Books is the world’s largest English-language children’s trade book publisher. Creating books for toddlers through young adult readers, in all formats from board books to activity books to picture books, novels, and e-books, the imprints of Random House Children’s Books bring together award-winning authors and illustrators, world-famous franchise characters, and multimillion-copy series. The company’s Web site, Kids @ Random (www.randomhouse.com/kids) offers an array of activities, games, and resources for children, teens, parents, and educators. Random House Children’s Books is a division of Random House, Inc., whose parent company is Bertelsmann AG, a leading international media company. 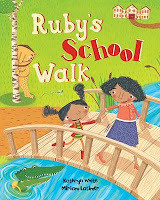 Here is my review of Ruby's School Walk, which is a great back-to-school title. 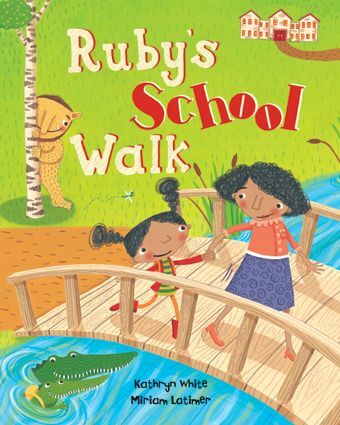 Ruby is going to school today, and as she walks there with her mother, she faces all kinds of challenges. There are the crocodiles in the “rushing river” for example. Ruby’s mother says that it is “just a stream, with silver fish and frogs and logs.” Ruby knows better though, and she scares off the dangerous reptiles by dancing on the bank. Next Ruby and her mother walk past what her mother says is “just an empty place for sale.” Ruby knows that the house is haunted, and she sings and does her “magic hop-a-long” to frighten off the bats and witches that live in the house. Though Ruby manages to make it to school, she then finds that she is “not so sure” about being at school. What is school going to be like? Will she be able to face her fears here as she did on the way to school? This enjoyable book will both entertain children and calm their fears if they are not sure about going to school for the first time. With an engaging rhyming text and bright cheerful illustrations, this picture book is a delight to read and to look at. It happens every autumn. Millions of young children start school for the very first time. They carry backpacks, lunchboxes, pencils, sometimes a grin on their face, but more often, a look of trepidation about what school will really be like. They wonder: Will my teacher be nice? Will I have friends? What if I can’t find my way? Who will sit with me? What will I do? What if I don’t like it? What if I miss home? What if it’s too hard? As parents guiding our children off to start school for the first time, or to begin a new school year, we want to do all we can to ensure that they have a great experience. At the same time, we want to encourage their independence as they set off on a new journey in their development. Read with your child and talk about the school experience. Share with them stories about your memories of school, both the good and the less so. School is an adventure, and like all adventures, it has its ups and downs. Help spark your child’s imaginations about school to encourage them to talk about their concerns and face their fears. You can do this through stories, books, drawings and other art forms. Ask them questions such as what they think school will be like, what they are excited about and worried about, what they think they will learn, etc. These conversations can also be had with grandparents and other favorite people in your child’s life. Build a community in your neighborhood. It is amazing what a familiar and friendly face can do to help a child overcome their fears about going to school. As your family journeys to school each day you might see this friendly neighbor, or only see them occasionally, but it will help your child feel comfortable and safe on their trip to school. Sit down together and create a fun map to school. Note interesting landmarks and have your child color them in or place numbers at each point. On that first morning to school, your child will be preoccupied with checking off the landmarks on their special map. The school can be drawn with welcome signs, making it a great triumph upon their arrival. Walk with your child to school whenever possible. If you don’t live nearby, take public transport, bike or drive and get out a few blocks away and walk together. The walk will become a meaningful way to spend time together and help get the day off on the right foot. Create traditions. Take pictures of your child in front of your home or on their way to school. Each year you can reflect back on these first day of school photos and see how much your child has grown in every way. Know that if the first day went well or didn’t go well, there are many more days of school throughout the year and peaks and valleys along the way. We hope your child’s first experience with school is part of their magnificent journey of growing up! Many thanks to Barefoot books for the material that was used in this post. Happy Friday everyone! For today's post I have a review of wonderful book of poems. All too often we are quick to notice how different we are from people who live in different cities or countries, who speak different languages, and whose skin is a different shade from ours. We judge based on how different we are rather than notice how much we have in common. 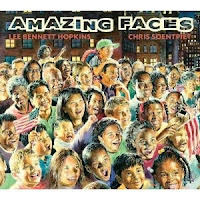 For this unique picture book, Lee Bennett Hopkins has chosen sixteen poems that all show to great effect that there are universal experiences and feelings that connect us. In the poem Miss Stone, Nikki Grimes explores a first day of school experience. We meet a little African American child who wishes “somebody, anybody/ Would come over and ask me to play.” How many children in playgrounds all over the world have felt this way? 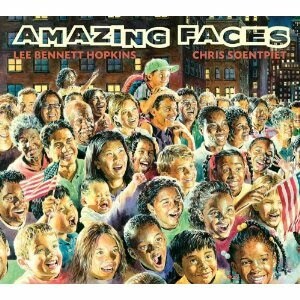 To accompany the poems selected by Lee Bennett Hopkins, Chris Soentpiet has created rich paintings full of expressive faces. We see smiles, sparkling eyes, looks of love, and looks of pain. We see in these amazing faces the threads that bring us together. Ham, Oh, the Places You’ll Go!, and all of Dr. Seuss’s books leap to life in this completely new website, designed to ignite a child’s creative thinking and imagination. Seussville.com is home to a dazzling array of entertaining and educational features that will delight Seuss fans young and old for hours on end. Lush animated environments offer an exploratory experience, and visitors to the site will uncover a wealth of innovative games and information—including a comprehensive character guide, searchable book catalog, an authoritative author section featuring a new biography and galleries of Dr. Seuss’s early sketches and artwork, robust parent and teacher resources, a customizable avatar activity, and more. Random House is also partnering with Big Bad Tomato to create a new Facebook game, set to launch in September. Similar to Farmville, the game will allow players to accumulate votes by completing a variety of Seuss-themed activities in pursuit of becoming the Mayor of Seussville. Fans can sign up on Seussville.com or by “liking” the Seussville fan page (Facebook.com/DrSeussBooks) on Facebook. Random House Children’s Books is the world’s largest English-language children's trade book publisher. Creating books for preschool children through young adult readers, in all formats from board books to activity books to picture books and novels, Random House Children’s Books brings together award-winning authors and illustrators, world-famous franchise characters, and multimillion-copy series. In 1957, Random House pioneered the beginning reader genre when it launched the Beginner Books series with Dr. Seuss’s classic The Cat in the Hat. Each year, Random House Children’s Books, along with Dr. Seuss, proudly supports the National Education Association’s Read Across America initiative, which calls on America’s children to celebrate the joys of reading in conjunction with Dr. Seuss’s birthday, March 2. Random House Children’s Books is a division of Random House, Inc., whose parent company is Bertelsmann AG, a leading international media company. The primary focus of the Dr. Seuss Enterprises, L.P. is to protect the integrity of the Dr. Seuss books while expanding beyond books into ancillary areas. This effort is a strategic part of the overall mission to nurture and protect the relationship consumers have with Dr. Seuss characters. Theodor Seuss Geisel (Dr.Seuss) said he never wanted to license his characters to anyone who would "round out the edges." That is one of the guiding philosophies of Dr. Seuss Enterprises. Audrey S. Geisel, the widow of Dr. Seuss, heads Dr. Seuss Enterprises as President. On this day in 1896 a party of travelers led by a man called Skookum Jim Mason discovered gold in Bonanza Creek in the Yukon. It all happened when Skookum Jim was heading north down the Yukon River looking for his sister Kate and her husband George Carmack. In addition to Skookum Jim, the group included Dawson Charlie and Patsy Henderson. The group found George and Kate fishing for salmon at the mouth of the Klondike River. It is not clear who made the actual discovery, with some accounts saying that it was Kate Carmack, while others credit Skookum Jim. George Carmack was officially credited for the gold discovery because the actual claim was staked in his name. The group agreed to this because they felt that other miners would be reluctant to recognize a claim made by an Indian, given the strong racist attitudes of the time. News of the discovery soon spread, and it wasn't long before people of all kinds were flooding into the region. Through the Looking Glass has reviewed an interesting collection of children's titles about this event. 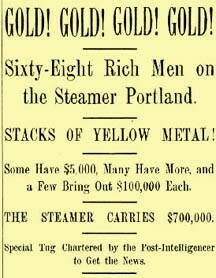 Take a look here to see the TTLG Klondike Gold Rush Feature. For this Friday the 13th I have a review of a wonderful collection of poems about animals. Children who enjoy sparkling rhymes and amusing characters are sure to like this book. Many of us who love animals imagine that we know a great deal about our furry, feathery, and scaly friends. We think we know all the tricks our pets can play, all the interesting things that they can do. However, there are some animals out there that are rather usual. Allow me to introduce you to Daisy. Daisy is a dog who does not like to eat meat. Instead, she likes to munch on watermelon, crunchy and sweet. Then there is Lulu, a skunk who does not smell “awful” the way most skunks do. Instead, Lulu smells like Chanel 5. Mocked by her peers, Lulu goes to live in Paris, where she soon finds “wealth and fortune.” Then there is Hope the hyena who is a “fine ballerina.” Unfortunately, Hope’s Sugar Plum Fairy debut does not work out very well because her appearance scares the children in the audience. What is a hyena supposed to do if she wants to trip the light fantastic? This delightful collection of poems will have children (and the adults in their lives) laughing out loud. William Wise’s deliciously funny poems are clever, and many contain at least one amusing and skillful play on words. Lynn Munsinger’s expressive animal characters perfectly compliment the unique poems in this book. 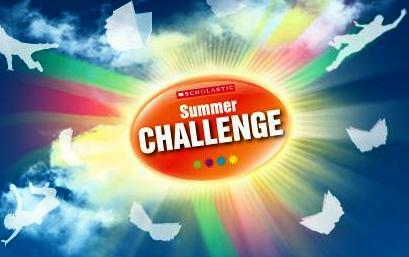 It's not too late to join the Scholastic Summer Challenge. Kids can Read for the World Record, they can help RIF put books into the hands of children who have very few books in their lives, and they can join Wordgirl, Scholastic's national "Ambassador of Summer Reading" in her summer reading mission. Today is the first day of Ramadan, a special month-long holiday celebrated by Muslims all over the world. In honor of this holiday I have review for you of a delightful picture book that was published this year. It is the day before the Eid, and Nabeel has completed his day’s work making shoes. One his way home, Nabeel stops at Hamzi’s clothes shop. He buys his wife a burqa and his mother a dupatta, and his daughter some bangles. Then he decides to buy himself a new pair of pants so that he too will be well dressed on the Eid. Unfortunately, the pants are four fingers too long, but perhaps Nabeel’s wife can hem them for him. When he gets home, Nabeel gives his wife Yasmeen her gift and then he asks her if she can fix his pants for her. The Eid is a busy time though, and Yasmeen has cooking to finish. At his mother’s house, Nabeel gets a similar response. His mother is delighted with her gift but she has cooking to do. What is poor Nabeel to do? Will no one fix his pants for him? Perhaps he should do the job himself. In this amusing holiday tale, children will not only be entertained by the narrative, but they will also see what some of the traditions of this holiday are. In addition, they will see how the members of a close family share their love for each other, and how it is a wonderful thing, even if things don’t work out quite as everyone expected! This summer, the Screen Actors Guild Foundation has an exciting opportunity to benefit our global children’s literacy initiatives. We are partnering with the Clothes Off Our Back Foundation to sponsor our second annual online auction of celebrity-authored signed books and your involvement would really help our cause! Between August 2 and August 17, you can bid on autographed books written by your favorite actors. 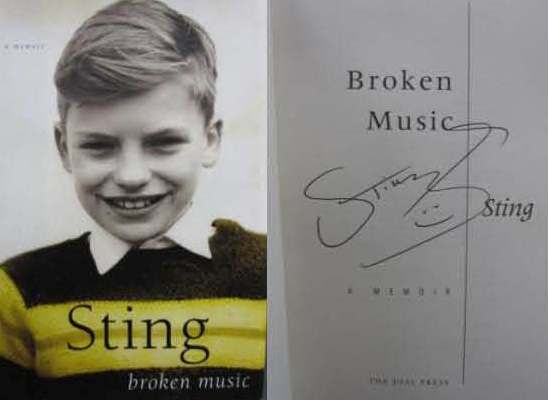 To support our efforts, celebrities including Sir Sidney Poitier, Kirk Douglas, Julie Andrews, Tim Allen, Sting, Carol Burnett, Mickey Rooney and many more have donated their signed books to be part of this auction. Take part in this auction by bidding on books that will make for great summer reading or the perfect gifts for friends and loved ones. Please visit http://www.clothesoffourback.org/sagfoundation beginning August 2, 2010 to view the selections and make your bid to support children's literacy. Cammy Hall is what anyone would describe as a loser. She lives with her grandparents and has adopted their way of life . . . right down to the comfortable shoes and early bedtime. And can she help it that she actually likes to knit? 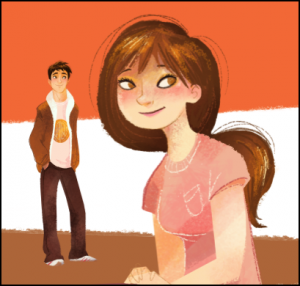 At school, her skills with knitting needles and some yarn go completely unappreciated: People like Bekka Bell reign while Cammy and her best friend, the fearless Danish exchange student Gerdi, watch from the sidelines. Cammy’s used to being an outsider; after years of humiliating moments, her goal is simply to fly under the radar. Then she suddenly starts receiving mysterious text messages that lead her right to all the embarrassing secrets about the most popular kids in school. Cammy never expected to be able to climb up the high school food chain, and the agenda of the texter may be questionable—but how can she possibly give up the chance to be queen? Loser/Queen is an online interactive serial and a groundbreaking publishing event. The beginning of the story has been written and posted—but it’s up to you to decide what happens next. Cast your vote by 5 p.m. (EST) Thursday night of each week. Then, check back Mondays at 10 a.m. (EST) to see the poll results—and how the story was affected by your choice! When the voting—and the book—are finished, Loser/Queen will be printed as a paperback and packed with extras from the author… and you will have the opportunity to own the book you helped create. Visit the Loser/Queen website to read the story so far and to cast your vote to help decide what happens next. Yesterday I posted a review of Resistance , a graphic novel that was written by Carla Jablonski. Today I am posting an interview that I had with her. 1. How did you get interested in the world of children’s books in the first place? I actually never stopped reading children’s books! Long after I was a “grown-up” I continued to love books for all ages. And I was lucky enough to land a job soon after college working in children’s publishing -- and never left! 2. Tell us a little about the books you have written. I’ve written a wide-range of books -- from humorous chapter books to intense YAs, from fantasy to historical fiction, along with movie tie-ins and adaptations. Most of what I write tends to be for middle-grade or teen readers. My most recent books have been Thicker than Water, a very dark YA for older teens about a goth girl who is drawn into an underground “vampire” lifestyle scene (out now in paperback!) and Silent Echoes, a YA novel set in both contemporary New York and the New York of the 19th century. Resistance is my first graphic novel, but I’m already at work on several more. I’m also a playwright/director and I think that’s why the comics medium felt very natural to me -- I understand “staging” and how to tell a story through dialogue. 3. Where did the idea for Resistance come from? I love writing (and reading) historical fiction and I love research, so I was casting about for a subject that would allow me to use those skills and tell a compelling story for kids. The Resistance allowed me to pose the question “what would I do?” which I think is a very powerful place to start from when writing. The situation is inherently dramatic, so finding ways to make my characters active was easy. I also was interested in the idea of secrets -- when to keep them, how to keep them, their danger -- and the Resistance certainly supplied me with a situation rife with them. 4. How did you research the story? Did you go to France at all? Oh, how I wanted to go to France! But no, all the research was done here in New York. I did LOTS of things - I read and read and read: histories of the war, memoirs written by resistance fighters as well as autobiographies of people who lived through the times, read up on winemaking in France; I also watched movies (documentaries and fictional films about the war and the resistance in particular) as well as films simply made during that period. I also looked at many images (The New York Public Library picture collection is a great resource!) for visual inspiration. 5. Did you work with the illustrator, Leland Purvis? Leland was great to collaborate with. When we first started working I gave him character descriptions and he showed me sketches for my input. Because he is such an experienced artist, I left many decisions up to him. My “script” broke the scenes into pages so he would know what I wanted to happen on each page, but, unlike some comics writers, I only rarely told him how I wanted each individual panel to look. I did specify what I wanted the pictures in Paul’s sketchbook to look like, though I often gave him multiple ideas to choose from. 6. When can we expect the second book in the trilogy to be available? Spring 2011. It’s called Defiance: Resistance Vol. 2. 7. In addition to writing books, you also edit them. Do you like doing this kind of work, and if so why? I do. I think it’s kind of a left-brain/right-brain thing. I like being able to switch back and forth between the two modes of thinking. I also find doing the editorial work really helps me with my own writing when it’s time to revise. 8. For fun, you perform on the trapeze. How did this start? As research! I was writing about circus performers and felt I would understand the characters better if I could experience what they did. For some reason I took to it, and I wound up performing in all kinds of shows in New York and in Edinburgh, Scotland. It was not exactly what I thought I’d wind up doing professionally with my masters degree…. But what a great -- and surprising -- detour! Not long ago I read a fantastic graphic novel - the first book in a trilogy - about what it was like to be in France during the German occupation. Here is my review of the title. Paul, his sisters, and his mother live in a small French village. Paul’s father is a prisoner of war in a German camp somewhere, and Paul is doing what he can to help his mother. Though no battles are taking place anywhere near their home, life in Paul’s village is still very hard. Everyone is afraid of being denounced to the Germans, and feelings of suspicion and distrust are rife. One day Paul goes to the hotel that his family owns, and he sees that the Germans have taken it over. He is immediately worried because the family who runs the hotel, the Levy’s, are Jewish, and if the Germans catch them who knows what will happen. Later that day that Paul finds Henri Levy in the woods and he tells his friend what has happened. Henri’s parents have disappeared, and Henri has nowhere to go where he will be safe. Paul decides that the only thing to do is to hide Henri in the family wine cave. He and his sister Marie have to keep Henri’s presence a secret, no matter what. Later that same day Paul discovers that Jacques, the family vineyard helper, is a member of the Resistance, an underground group of people who are doing what they can to make life difficult for the Germans. Paul quickly offers to join the Resistance. He wants to do his part as loyal French citizen. At first Jacques refuses to consider Paul, but later he agrees to let Paul, and his little sister Marie, join the Resistance. After all, the Germans will never suspect that two children might be a threat. This powerful and often disturbing graphic novel gives readers a very true to life picture of what it was like to live in France during World War II. No one, not even the children, are untouched by the terrible things that are happening around them. They live in fear, and on occasion, they are called on to risk everything for a cause that is bigger than they are. 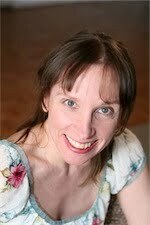 Tomorrow I will be posting an interview with the author, Carla Joblonski.